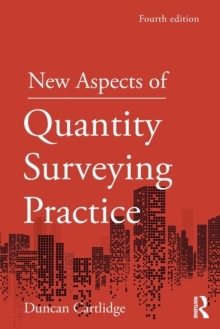 In this fourth edition of New Aspects of Quantity Surveying Practice, renowned quantity surveying author Duncan Cartlidge reviews the history of the quantity surveyor, examines and reflects on the state of current practice with a concentration on new and innovative practice, and attempts to predict the future direction of quantity surveying practice in the UK and worldwide. The book champions the adaptability and flexibility of the quantity surveyor, whilst covering the hot topics which have emerged since the previous edition's publication, including:the RICS `Futures' publication;Building Information Modelling (BIM);mergers and acquisitions;a more informed and critical evaluation of the NRM;greater discussion of ethics to reflect on the renewed industry interest;and a new chapter on Dispute Resolution. As these issues create waves throughout the industry whilst it continues its global growth in emerging markets, such reflections on QS practice are now more important than ever. The book is essential reading for all Quantity Surveying students, teachers and professionals. It is particularly suited to undergraduate professional skills courses and non-cognate postgraduate students looking for an up to date understanding of the industry and the role.